Welcome to the first edition of Mentoring Mondays! I am thrilled to have Kristen Hoetzel of Cooking With Mickey here with us today to share some insight on blogging and social networking. She and her husband Aljon Go live in Nashville, TN and are currently in Disney Happily Ever After Contest. They are such a cute couple, their picture is in the middle of this post. Please go vote for them, it takes just a minute. Kristen's favorite classic movie is Alice in Wonderland, here is a picture of her with the White Rabbit. Introduce yourself and describe your blog. 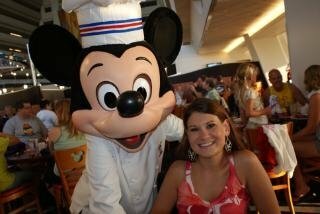 I'm Kristen Hoetzel, creator of Cooking with Mickey. CookingwithMickey.info is a blog about Disney dining information, recipes, reviews, how-to videos, news, vacation planning, travel deals, trip reports, cooking tips and more. I had been making Cooking with Mickey videos for Sorcerer Radio to show people how easy it was to make their favorite Disney recipes. I wanted to share more than just my videos so I started my blog so I could write about everything I loved about Disney, share more of my knowledge about food and cooking and let people read about my visits to the Disney parks and what I loved the most. What do you think is the best way to attract new readers/followers? Get to know people who have similar interest to your own. Chat it up with people online. You can join forums, chat rooms, Facebook, Twitter, MySpace, etc. Just interact with people. What is the best/worst advice you have ever received? I haven't received much advice from others. I've always been someone who likes to learn the hard way. LOL! I would have to say that I've been told to contribute to as many blogs as possible and to have as many contributors to my own blog as I can find. I find that people get lost in blogs set up that way and you have no connection to your readers and they don't get to personally connect with you. What is the biggest mistake most new bloggers make? Trying to be someone they are not. You need to write your blog the way you are. Don't be afraid to inject your personality into it. Let your readers get to know you and be genuine. I think it's a great way to get your blog information out to people and get to know others who have similar interests to your own and what you write about. There really is no key to getting followers or likes. If you write interesting information and interact with people they will follow/like you and spread the word to their friends about you and your blog. Some people like to use the apps that gain followers on Twitter however, those often get people who have nothing in common with you and many times some undesirables. How important are labels, and do you have any advice on choosing labels for posts? I'm very big on adding these to my posts. I find all of the key elements to my posts and include those words in my tags. So choose those things that stand out and include the name of your blog. This is a very difficult question! I have several favorites and I can't pick just one so I'll give 2 of my favorites. The first is Belle from Beauty and the Beast because she is smart, educated, wants more out of life - she has ambition and doesn't judge people. The second would have to be Remy from Disney/Pixar's Ratatouille. From the name of my blog it should be pretty easy to see why. He loves to eat good food and to cook. He finds fun in be creative and combining different flavors to create dishes. He also helps others and he believes in Gusteau's philosphy, "Anyone can cook!". Get the Disney Dining Plan. It will save you money. If you are someone who enjoys dining at different restaurants and you like two sit down meals a day and want to try the signature dining restaurants, get the Deluxe Disney Dining Plan. You'll find that it will save you a lot of money. On one trip my husband and I did the Deluxe plan and saved nearly $500, and it's nice not to have to worry about the price and order exactly what it is you want. Thanks so much for asking me to be part of this Donna Kay! I hope your readers enjoy my interview and find it helpful. They can always find me on Twitter as @CookingwMickey or on Facebook as CookingWithMickey. Some of my videos can be found on my site but the others are on my YouTube channel, Cooking With Mickey. Thanks again! 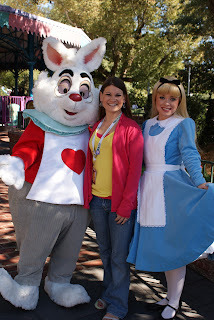 Silly me, I got so excited when Kristen agreed to do this for me I forgot to ask her about her favorite Disney recipe. I asked her when she returned the interview and she was nice enough to answer for me. My favorite recipe is easily the Curry Butternut Soup from Boma over at Disney's Animal Kingdom Lodge. The soup is very easy to make and it's perfect for a cool, crisp fall day or cold winters night. It's got a kick to it and if you don't like things spicy you can always use less of the curry paste. I bring this to either Thanksgiving dinner as an appetizer or Christmas Day as lunch. It's also probably the Disney recipe that I've made the most because I find it to be perfect for those times of year and to be very tasty. If you go to Kristen's blog she has a video showing you how to make it, look for it posted on April 27th! Kristen, thanks so much. You are so sweet to take the time to share your knowledge with us. Good luck with your Year Long Culinary Project, I will be following! I hope all of you will be following her too. Awesome first interview! I don't know how I've missed this blog, but I'm heading over now to follow! Donna Kay, thanks for setting Mentoring Mondays up- what a great idea! And Kristen, thanks for participating and giving us these wonderful tips! Yay!!! Love this! Congrats, Donna, on your first Mentoring Mondays article! I can't wait to post mine on May 16th! Loved reading about Kristin! Kristen, I know I have told you 100 times but thanks again!! Amanda, I am really looking forward to your interview in 2 weeks! Beth & Bird, I am so honored that these awesome bloggers have agreed to do this, great advice helps us all whether we have been blogging a week or 10 years. Great interview Donna! I am looking forward to reading more from your series. I have always enjoyed Kristen's blog- now I know why! 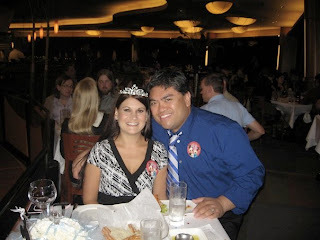 Donna, thanks so much for fostering mentorship and fellowship within the Disney blog community. I loved your interview with Kristen. 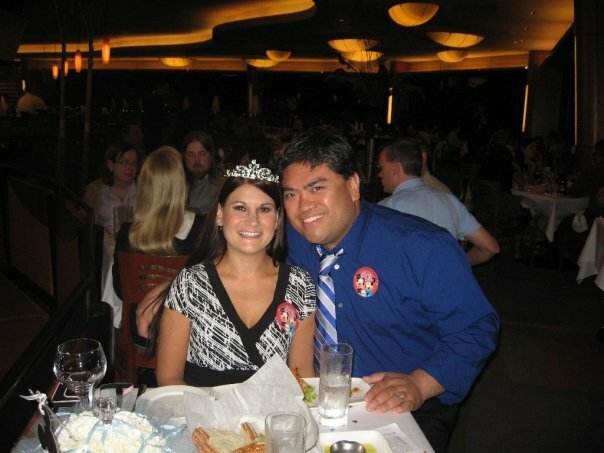 I definitely agree about the Disney Dining Plan, it saved us hundreds. I love tips keep them coming. You wife is pretty awesome! I was lucky to have her as my very first Mentoring Mondays! !